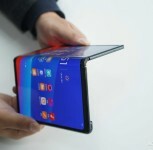 Foldable phones appear to be the trend at the beginning of 2019. Samsung has the Galaxy Fold, yesterday Huawei introduced the Mate X, TCL revealed some foldable dummies at MWC 2019, and now Oppo is jumping the hype train. 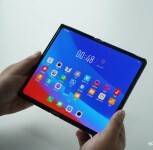 Brian Shen, Vice President at the Chinese phone maker, posted on his Weibo profile a foldable prototype. 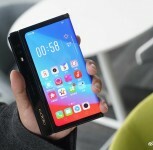 He said it is just a demo unit and the technology is not bringing huge improvement in user experience, so Oppo has no plans to launch it for now. 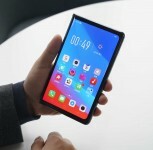 Looking at the phone, we can’t run away from the obvious fact that it looks exactly the same as the Huawei Mate X - huge display folded outwards, creating two separate screens. There is also a bump or a handle on the side where we see the company logo and the camera setup in a vertical fashion. Although there aren’t any specs available, since it is a demo unit, we can see two different shooters above the dual-LED flash. If they aren’t dummies, we are looking at a main camera, accompanied by a depth sensor. Looking further into details, we see at least three buttons and what appears to be a fingerprint scanner below the volume rocker. It could also be a key to power the secondary screen, similar to the dual power button solution in the vivo NEX Dual Display. Brian Shen asked in his post “how much do you really want such a device”, and we are asking you the same - would you buy this phone if it reaches the pipeline? Let us know in the comments. Thanks for the tip, Venkatesh! "never innovates" lol. which version of earth are you on? coz here in our earth huawei was so innovative as of late. "...Brian Shen asked in his post Â“how much do you really want such a deviceÂ”, and we are asking you the same ..." I don't!